Uvulitis is a condition in which that dangling piece of flesh (uvula) at the back of your throat gets enlarged and swollen. Many people don’t even think about their uvula or may not even know what its role is. Well, a uvula helps with speech articulation as well as filtering out bacteria that might contribute to respiratory and digestive problems. If caught early enough, uvulitis won’t result in complications, but if the inflammation of the uvula continues without treatment, then complications can arise. In some individuals, a swollen uvula gets so big that it actually touches the tongue and may trigger gagging or choking sensations, causing eating, talking, and even breathing difficulties. Although uvulitis isn’t a common condition, it can still occur nevertheless, so we are here to explain the causes, symptoms, and treatment for swollen uvula in case you or someone you know ever develops the condition. There are numerous causes for a swollen uvula – some more serious than others. In any case, it’s important to see your doctor in order to reduce your risk of uvulitis-related complications. Here are 25 possible causes of swollen uvula. Allergies and hay fever: A person with a severe allergy who comes in contact with their allergen can experience swelling and closing of the throat. In this scenario, the swollen uvula may even prompt for emergency care. Seek medical attention right away if a person is going into an anaphylactic shock. Hereditary angioneurotic edema: In this condition, caused by a gene mutation, different areas of the body can become swollen – uvula included. This is quite rare, and the first sign of hereditary angioneurotic edema usually presents itself during childhood. Genetic conditions: Other genetic conditions aside from hereditary angioneurotic edema can result in swollen uvula. Some individuals may have an elongated uvula, and although the symptoms of uvulitis and elongated uvula are the same, they are different conditions. Throat infections, bacterial infections: Although the role of the uvula is to filter through bacteria to keep the digestive and respiratory systems healthy, it can contract bacterial or throat infections on its own. 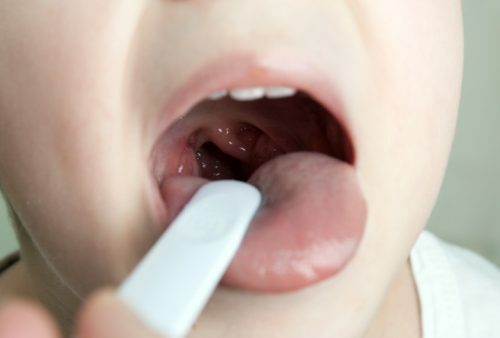 Strep throat, for example, can result in a swollen uvula along with tonsillitis. Treating bacterial infections can help reduce swelling and inflammation. Tonsillectomy or post-surgery recovery: Surgery on the nose and mouth can cause swollen uvula. It is quite common for a patient to experience uvulitis after a surgery as a result of anesthesia. Inflamed uvula from drinking alcohol: A person with an alcohol allergy can experience swollen uvula after consuming alcohol. Another reason why a uvula may swell after alcohol is due to dehydration. Dehydration: When you are dehydrated, the throat becomes quite dry – this is also seen in alcoholics and smokers. Increasing your fluid intake can help prevent uvulitis caused by dehydration. STD, oral thrush, and yeast infection: HIV, herpes, and oral thrush can all contribute to swollen uvula as well. Bump can occur on the throat and tongue, along with a yellow tongue and bleeding, swollen tissue. Strep throat: As mentioned, strep throat is a common cause for the swelling of uvula, as it is an infection. Smoking: Smoking can cause a dry throat, which can cause uvulitis and also acts as an irritant and pollutant, increasing the risk of swollen uvula. Acid reflux and vomiting: Acid reflux and vomiting are irritants, which may lead to inflammation of the uvula. Breathing through mouth while sleeping: Breathing through your mouth while asleep dries out the throat, causing a sensation similar to dehydration. The result is an inflamed uvula. Getting to the bottom of why you are breathing through your mouth while asleep can help prevent a swollen uvula. Common cold: The common cold can turn you into a mouth-breather and cause an infection. Both these factors contribute to swelling of the uvula. Other causes of enlarged and irritated uvula: Exposure to very hot or cold food, inhalation of irritants or pollutants, canker sores that develop on the uvula, cancer and growths in the throat, some medications and drugs that irritate the throat, glandular fever, lupus disease, laryngitis, sleep apnea, and nasal drip side effects. Due to the variety of causes for swollen uvula, there are numerous treatment options as well. For example, treatment for uvulitis can be as simple as drinking more water or avoiding allergens. Or, it can be more intense like the use of corticosteroids or even surgical removal. Antihistamines can be used if swollen uvula is a result of an allergic reaction, and corticosteroids are used in more severe causes. If you’re a mouth-breather or snorer, then a mouth guard may improve your condition, or a CPAP device in case you have sleep apnea. Not smoking and reducing your intake of alcohol, too, can treat swollen uvula. If uvulitis is a result of an infection, then appropriate medications are prescribed. In order to obtain the best treatment for swollen uvula, you should see your doctor to determine the underlying cause of your condition. There are some home remedies that you can use in order to treat swollen uvula. Here are those home remedies for uvulitis you can try to improve your condition. Consume cold beverage and ice cream to soothe the throat – avoid if cold food and beverages is the cause of your swollen uvula. Consume more fruits and vegetables to boost your immune system and prevent infection. Consume honey to keep the throat lubricated – honey is also a natural antibacterial remedy. Drink ginger tea as it is a natural anti-inflammatory. Drink basal water as it can reduce throat irritation. Chew on gloves of garlic. These home remedies can help ease irritation and improve your swollen uvula. It’s important, though, that you still speak with your doctor to determine the actual cause of your uvulitis, so that your can prevent any serious complications. You should see a doctor immediately if you experience severe pain, severe difficulty swallowing, difficulty breathing, uneasiness (as a result of lack of oxygen, choking, and grunting), and blood or pus from the uvula.